While typically eaten for breakfast or in a small portion for pudding, everybody knows that pancakes are delicious anytime. 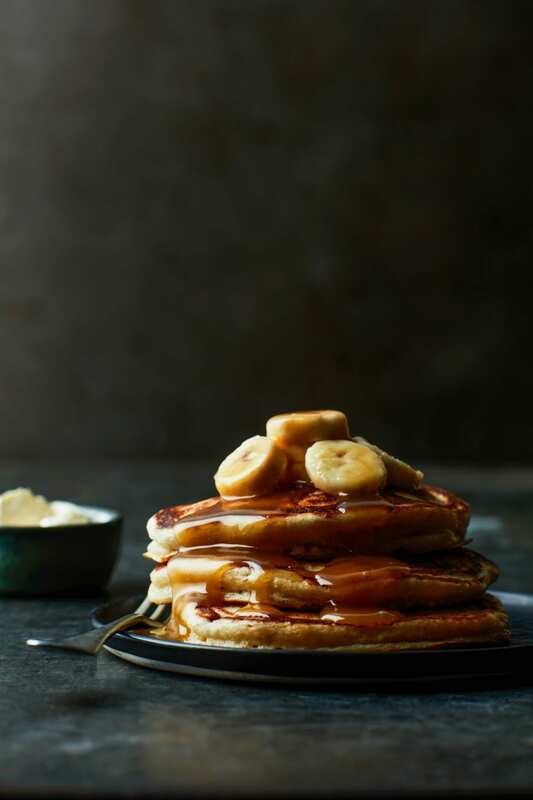 This indulgent dish features the American-style thick pancakes rather then the thin version that are more like crepes. Think fluffy, high, spongy, when your fork cuts through them down to the plate, with the butterscotch sauce drizzled over it. Serve them in a stack for authenticity. Buttermilk adds moistness, tenderness and flavour, and lightens your batter. If you don’t have buttermilk, you can substitute it using lemon juice or white vinegar added to full-fat milk. Another option is to use yoghurt or sour cream thinned with milk. Use 2 tablespoons of freshly squeezed lemon juice or white vinegar to 1 cup of regular milk. Cook’s tip for this recipe: Don’t worry if the butter and sugar look separated as they melt and simmer, as the sauce will come together when you add the cream. Mix the flour, sugar and bicarbonate of soda in a mixing bowl with a pinch of salt. Make a well in the centre and pour in the buttermilk and egg, whisk together until smooth, then set aside for 30 minutes. For the butterscotch sauce, melt the butter in a small saucepan over a medium heat, then add the sugar and allow to dissolve. Simmer for 4-5 minutes, stirring regularly, until golden. Take off the heat and stir in the cream, vanilla and salt. Heat a large frying pan over a medium-low heat. Melt a knob of butter, then add a small ladleful of the batter and spread to a circle roughly 12cm in diameter – cook 2-3 at once, if possible. Flip after 2-3 minutes when bubbles appear, then cook for another 2-3 minutes. Repeat to make about 8 pancakes. Stack onto plates, top with the banana and spoon over the warm butterscotch sauce. Serve with whipped cream too, if liked.